We are not living in a one-size-fits all world. However, we are living in a world where we all just want to feel confident in what we wear. How many of us have spent wasted minutes google searching: “What looks best on my body type?”only to be hit with a million articles and too.much.information! Well, that’s why we’re here. From playing up the features that you love and toning down what you’d leave left to the imagination, we’ll show which dresses to wear to flaunt your curvy figure. Keep reading for our guide to the best dresses for curvy figures. Is a maxi dress your style? Opt for a more structured fabric (ditch the jersey this time) in lieu of something with, drape, gossamer layers, a side slit and some personality. Extra bonus points if it has a lining to lay smoothly over your curves. Body Shape Match: All body types (styling tricks like belts and shoes help highlight the features you love!). Wear it with: The key to most maxi dress styles is a defined waist—so if it doesn’t already come with a belt, find one to play up your waist. In fall, wear them with high boots or ankle booties and tights. Universally flattering, the criss-cross V-neck of a wrap dress provides shape up top, elongates your neck and hugs your best assets. There’s a reason why the wrap dress is considered one of the most versatile dresses anyone can own. Body Shape Match: All body types. Wear it with: Get friendly with fabrics! Because this silhouette is perfect for all occasions, take your styling cues the fabric you’re wearing. If it’s cotton and casual (but you want to dress it up!) accessorize accordingly. Wearing silk? Dress it down with sneakers or sandals. Or, go all in with black patent pumps and your favorite statement stunners. Comfortable and effortless a shift dress in a fitted silhouette is the ultimate easy-to-wear piece for every day. Not only does it have built-in structure and shape, but since it falls directly from the shoulders, it gives you great definition. Body Shape Match: Apple and inverted triangles. Wear it With: The shift dress is the perfect piece to highlight your legs (if that’s what you’re into). Just add sneakers for day and a denim jacket or a blazer and black sling-back pumps (a la Duchess Meghan Markle) for events and special occasions. A must-have for all women. We love shirt dresses for their built-in structure, button-down neckline and weekly wearability. Body Shape Match: Hourglass and pear body shapes. Wear it With: Our favorite pieces are ones you can throw on with little to no thought or added fuss. Wear it with sandals in summer or pair it over your favorite bootcut jeans with a classic belt and boots for fall. Ready for a new dress? 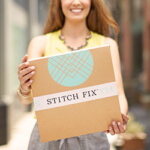 Schedule a Fix and let your Stylist know that you’re looking for a new frock!